Dos Chinos on Dos Wheels: Somebody Pinch Me! Some days I just can't help but wondering, "where the heck am I???" Today I was briefly transported to India when I received the following email from an Indian colleague, J, who I have exchanged no more than a dozen hi's in the past year. Behold a copy of my marriage invitation attached. Proof that it is finally happening! It would give me immense pleasure if you could grace the occasion by your presence. Your prayers and blessings will be appreciated in any event. However, it would give me equal pleasure if you could come to enjoy a lunch on Monday the 17th of August at our office at 1:00 pm. It is no coincidence that the marriage ceremony is also scheduled for that day in Cochin – India. Enjoy the lunch as I bid farewell to bachelorhood. 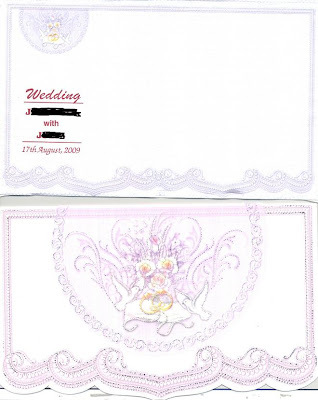 Apparently it is very common in certain Asian and African cultures to send out an office-wide wedding invitation. Personally I think they make some of the best social celebrations, but I'd feel weird not knowing the happy couple fairly well. Culture shock aside, it also made me smile to read the bible verse quote on the invitation, "It is not good for a man to live alone, I will make a suitable companion for him. (Gen. 2:18)"